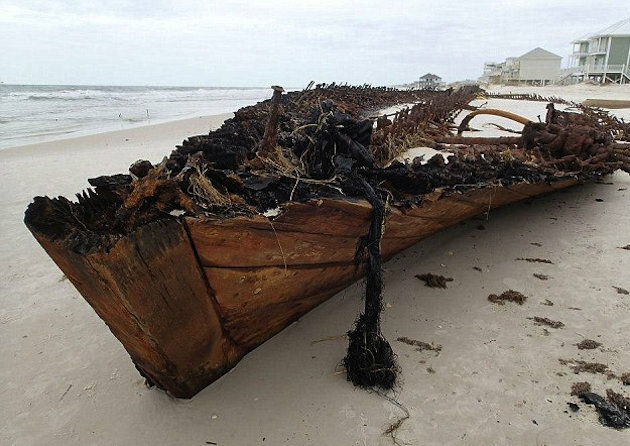 Hurricane Isaac has washed the remains of a blockade-runner vessel onto the shores of an Alabama beach, and many believe it could be a Civil War-era vessel, dating to 1862, according to the Birmingham News. However, a debate has ensued over exactly which era the shipwreck is from. "Look what Isaac uncovered!" reads a Facebook post from Meyer Vacation Rentals, a local real estate company that posted several pictures of the wreckage on its fan page. A number of Confederate ships attempted to circumvent a Union Navy blockade of Mobile Bay during the Civil War. And some believe the wreckage may belong to the Monticello, a ship that burned and sank while trying to break the blockade during the war. This is actually the fourth time parts of the wreckage have become visible over the years, after it first made an appearance following Hurricane Camille in 1969. It reappeared in 2004 after Hurricane Ivan and again in 2008 after Hurricane Ike. "Based on what we know of ships lost in that area and what I've seen, the Monticello is by far the most likely candidate," Museum of Mobile marine archaeologist Shea McLean told the Birmingham News in 2008. "You can never be 100 percent certain unless you find the bell with `Monticello' on it, but this definitely fits." Still, there's no consensus on just how old the 136-foot-long ship actually is, with some speculating that it may be a rum runner that sank during Prohibition. "Either way, it's quite interesting. This is the most visible it has been in recent years. Eventually the shifting sands will pull it back under the beach, where it will slumber until another storm is powerful enough to bring it back to the surface," the Meyer Vacation Rentals post continues.